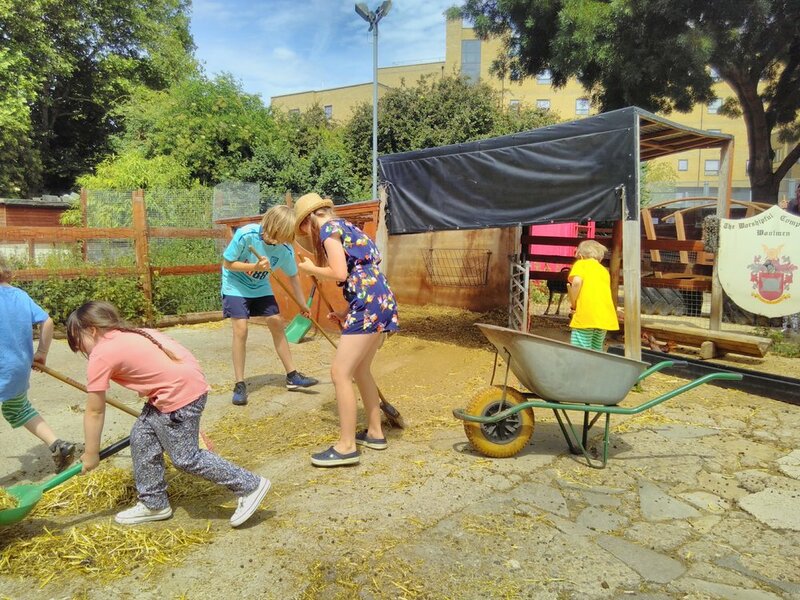 Today was a special day, as we had not just one, but TWO Families Go Wild birthdays, and Families Go Wild volunteers were all generously invited to the birthday party on the farm. We walked round the poultry pens, including the ducks, geese and chickens, to search for eggs. We found a lot between us! Next was the important process of boxing them and labelling them for the farmshop. Selling eggs from our animals is one of the ways we make money to keep the farm running, so it was a very helpful job for our volunteers to do. Some of our volunteers like to buy the eggs they collect from the farm on the same day. They taste even better when you've collected them yourself! Once the eggs were packaged and ready for the shop, we got to our big task of the day. This was to sweep the sheep paddock in the yard. We had a couple of volunteers who had come to London from Wales. They told us the last thing they expected to do in the city was farming! Although this is one of our favourite jobs, some of us felt slightly nervous about the sheep being in the paddock with us while we worked. We talked it over as a group, and we decided that if it became difficult, we would keep the sheep in a different part of the paddock while we swept. In the end, that was the right decision, and we were fine working around the sheep. It was a good opportunity for our volunteers to improve their confidence around animals, and a great exercise in communicating with each other as a community! After sweeping up in the paddock, we emptied the dirty straw and sheep poo onto the muck heap. To some people, the muck heap may look like waste, but here at the farm, there is no such thing! Once this rots down, we will use it to grow plants in the garden! On the farm, it's important to leave things as we find them. This means that tidying up after ourselves is a key part of our volunteering sessions! Once all our tools were tidied away, it was time to walk the ferrets! We took out the special harnesses and strapped in Peanut and Pickle, the ferrets. While they were being strapped in, we decided the order in which we would take turns to walk them. Once we came to a decision, the first pair took Peanut and Pickle for a walk! We learned that ferrets like to burrow, so we took them to the barn for a play in the straw. We enjoyed watching them exploring their surroundings, and the ferrets only managed to wriggle out of their harnesses a couple of times! We took turns very well, and were patient when others were having their turn with the ferrets. We communicated well as a group, and we were happy to let some people have extra time with the ferrets towards the end of the session. Once the ferrets were back in their enclosure, it was PARTY TIME! Note from Ilana: Ferrets can sleep up to 20 hours a day! They are social animals, and like to live in pairs or groups, except our resident loner, Marmite! If they are alone however, they need plenty of interaction to keep them happy and healthy. It's important to keep them away from prey animals, such as rabbits and guinea pigs, as the ferrets' smell can cause them stress. On the farm, we always make sure there aren't any other animals wandering about when we walk the ferrets, as their instincts may kick in and their sharp teeth could cause casualties!